“Smart is not just ticks and crosses, smart is building boats from boxes. Painting patterns, wheeling wagons, being mermaids, riding dragons…”. As the title suggests, this book explores the different ways children can be smart, including hands-on practical skills (‘building cubbies and making slime’), social-emotional skills (‘kindness when there’s crying’), creativity (‘drawing witches hats...and gluing wings on bats’), as well as the more traditional intelligence (‘knowing all the planet names’). 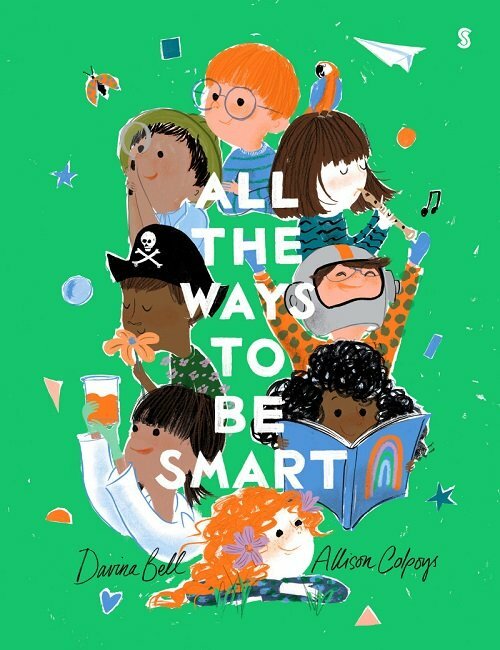 Through playful rhymes and whimsical illustrations, All the Ways to be Smart celebrates the many unique qualities that make children special. The value of diversity is subtly reinforced through the variety of ethnically diverse characters. This book will give a confidence boost to any child who feels like they don’t quite fit in. Regarding speech and language skills, All the Way to be Smart covers many different action verbs both in the text and illustrations. It’s written using mostly present progressive tense (words ending with -ing) and is packed full of regular plural nouns; making it an excellent model text for these goals. For further speech and language targets in All the Ways to Be Smart, see the list below.